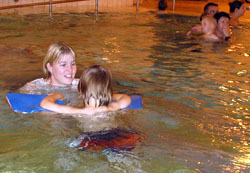 Seaford Down’s Syndrome and Special Needs Support Group Swimming Programme for children with complex needs. Supported by the BBC’s Children in Need, the programme runs each week at local pools. When we first started our swimming programme there was only two sessions, held each Sunday afternoon at the Seahaven Pool in Newhaven. They were initially, one for complete non-swimmers, where family members were allowed and encouraged and the second was for those a little more confident in the water on a solo basis. During these trial sessions, we endeavoured to find a way to expand and secure these sought after programmes. Since then we have been supported with the generous funding of the BBC’s Children in Need and now have a multitude of programmes that cover a wide range of abilities. These sessions are still run at the weekends, with most being run at the Seahaven Pool in Newhaven and also a session at the Seaford Head Pool in Seaford. Update: We’re pleased to announce that as of March 2018, our programmes will, once again be partially supported by Children in Need, who have generously awarded us a three year grant. Youngest children with Parent/Carers and siblings. This session is all about building confidence in the water. Quite often this session looks really busy as we encourage families to take part together in a fun but relaxed environment designed to set the new swimmer at ease. Still with the support of Parent/Carer and siblings. Once confidence has been gained in the water, the real lessons can begin. In-between group for those who are confident and swimming widths, but not yet swimming lengths. Now we’re really swimming! This group builds on the child’s swimming skills, with the goal of swimming whole lengths of the pool, with a view to exit into mainstream sessions. 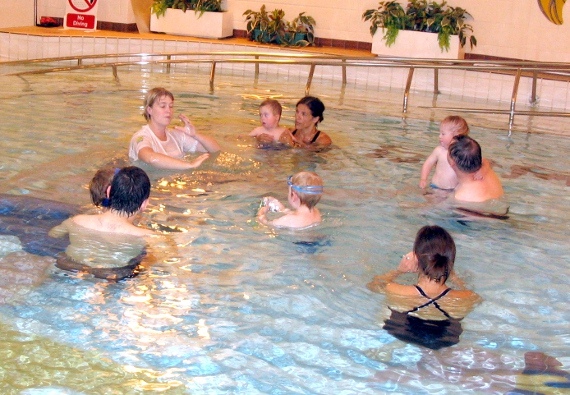 Each session is run by fully trained swimming instructors and lasts thirty minutes. Why Swim? 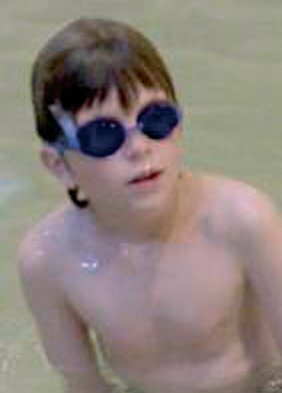 Swimming is a great form of exercise and can help improve muscle tone for all and particularly for children with complex needs, whom might not otherwise be able to exercise effectively. Swimming helps to Improve coordination and repetitive exercise is key to that gross and fine motor control that must improve for good coordination. It increases self-confidence. The children are learning a new skill, this helps to increase their self-confidence. All Sessions are designed to be fun, as well as instructive. Safety in the water is paramount at all times and life guards are always on duty. 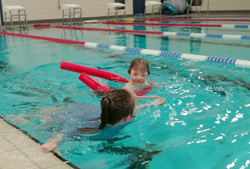 The Swimming Programme costs a £1.50 per child, per session, to be deposited into the Seaford Down’s Syndrome Support Group collection bucket, which will be pool-side. You can prepay for multiple sessions, if that is easier for you. Any donations over and above these costs must be clearly marked as such. 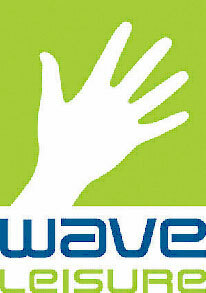 We also thank Wave Leisure for their on-going generous support, without whom, this fantastic service couldn’t be offered. If you are interested in finding out more about the Swimming Programme please contact our Swimming Administrator, Mrs Daryl Cogavin, preferably by e-mail on daryl@seaford-dssnsg.co.uk or via mobile on 07562 868 397, and leave a message/SMS.